Seca attaches great importance to people’s health. 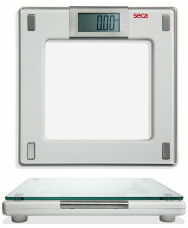 With the high quality scales seca Aura 807, the world market leader for medical weighing has now developed digital scales which meet the highest demands on precision, comfort and design. You should not accept less when it is a question of your health. The seca Aura 807 is well-suited for hotels and private households. Step-off function: In addition to the normal tip-on function, the seca Aura 807 has the comfortable and fast step-off function. The scales switch on as soon as they are mounted and automatically adjust to zero, taking any changes in the environment into account. Your exact weight is displayed as soon as you step off the scales. Large display: The clear LCD display with large, 29 mm high letters means that the result can be read quickly and easily.